Even though some videos may be VOB format obtained by ripping DVD disc, it can't stop people imagining to change it as a personalized movie. Everyone has a dream to be a Hollywood movie star, right? So, we all want to put VOB file to editing software like iMovie. 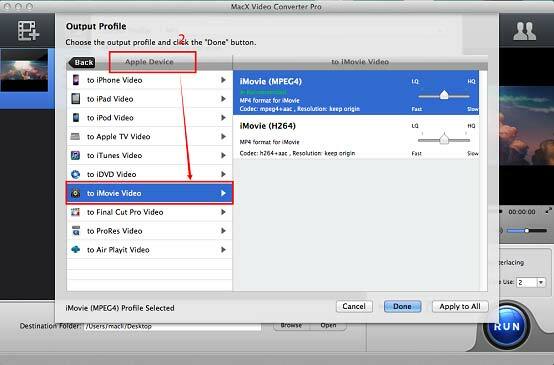 But, there is also a problem: how to transcode VOB videos to iMovie on Mac? 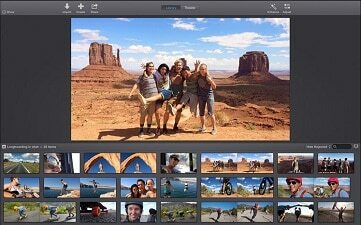 As we know, iMovie is the fantastic and free video editing software which is released by Apple Enterprise. The functions like trailing movies, clipping videos and making Hollywood-like movies by adding effects or soundtrack are totally satisfied all of people's needs to create a personalized movie. How useful the iMovie is! And why don't you try to convert VOB to iMovie supported video format for editing on Mac like convert VOB to MP4? 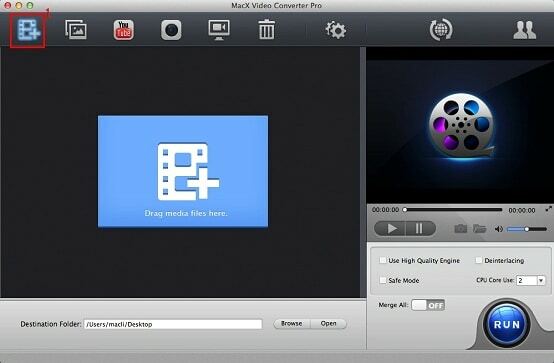 The full-featured software: MacX Video Converter Pro makes editing video on iMovie become possible. And built-in 370 codecs, it enables you to compress and change VOB to iMovie supported formats like MP4, MOV, M4V, as well as MKV AVI FLV WMV 3GP MP3 iPhone Ringtone, 180+ video and 14+ audio formats. With over 359 preset profiles, it solves all video incompatibility issues for Apple devices and Android devices like iMovie, iPad (iPad Pro/iPad mini 4), iPhone (iPhone X/8/7/7 Plus/SE/6S/Plus), Apple TV 4, iTunes, HTC, Samsung, Sony, Microsoft and other mainstream players or editing software. By this VOB video transcoder, you can easily edit your movie as you like. Notes: MacX Video Converter Pro is especially designed for Mac users to transcode VOB video to iMovie on Mac (Mac Version free download). If you are a Windows user, please head to the Windows VOB to iMovie converter to get the job done. Input the VOB file by clicking "Add File" Button and begin the process. Choose the iMovie as the output profile which is in the sub-category of Apple device. In additoin VOB video files to iMovie, you can also choose to convert vob to iTunes, other formats, devices or services. Select the destination folder for the target video file by clicking "Browse" Button. Clicking "RUN" to start conversion and you can view the process or stop it at anytime. With several easy steps to finish decoding and decoding VOB format to iMovie format on Mac, you are allowed to freely edit these videos in iMovie. Moreover, downloading YouTube videos, converting any HD videos, record screen activity for guiding and so on are also available for Mac users.